I received an email today with the subject line “High altitude boots”. For a moment I thought it was going to be an advert for extreme high-heeled shoes, but it turned out to be a request for a copy of a somewhat obscure article by Griffith Pugh (1909-1994). He was a physiologist who worked here 1950-1975 and is most well known for his contribution to the success of the 1953 Everest expedition (see the piece in the MRC Network newsletter in 2008). Pugh was an estimable character. His full name is Lewis Griffith Cresswell Evans Pugh, and I always think that someone with four forenames deserves some respect. He had an interesting life – he was a climber and a skier (he was selected for the 1936 Winter Olympics skiing team but was unable to take part due to injury). During the second world war he spent time training troops at the School of Mountain Warfare in the Lebanon. Then he joined the MRC and had to be content with the rather lesser hills of Hampstead and Mill Hill, until he became involved with the Everest expedition. 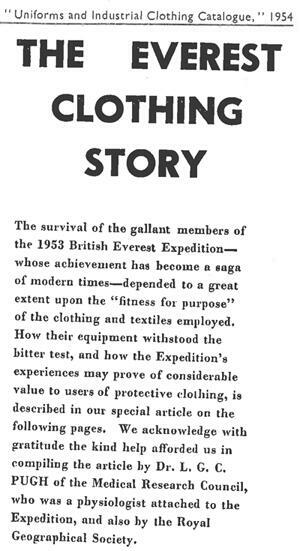 Box 18, Folder 2: Everest Clothing Story, 1954. Reprint, galley proof and correspondence. Not sure what to expect, I ventured to our dusty library store. There is one catalogue of papers written by MRC staff , covering ca. 1950-1980, with boxes of reprints to match. I searched and found the article listed under Pugh’s name (which was mildly surprising as the article is not actually by him, though it references his work extensively), but when I checked the appropriate box the reprint was not there. That is not unexpected – not everything in the catalogue has a corresponding physical item. We also have a second, larger, catalogue (and collection) of reprints and pamphlets going back to 1920; this has things of interest to staff but necessarily written by them. The article was listed in this catalogue too and luckily this time the item itself was in the corresponding box. The abstract is below. I couldn’t help but feel a debt of gratitude to those cataloguers and typists nearly 60 years ago who had produced the index cards, and to the accurate filers who had placed the reprint in the correct box. Their painstaking work back then made it possible for me to supply the item to Harriet. The article explains how Pugh tested several different kinds of boot for possible use in the expedition. The ideal boot needed to be both warm and lightweight, and should not interfere with the wearer’s balance on rock and ice. It also describes the rest of the clothing selected for the expedition. I am a librarian in a biomedical research institute. I've been around a few years, long enough to know that exciting new things fall into the same familiar patterns. I'm interested in navigating a path for libraries as we move further from print to electronic resources to open research, and become more embedded in research workflows. This entry was posted in History and tagged Everest, Pugh. Bookmark the permalink. How did Pugh’s archives end up at UCSD? Anything to do with Prof John B West of “Respiratory Physiology’ fame? Austin – I am not altogether sure. The main record of the collection doesn’t seem to explain how it came to be deposited there. UCSD has an extensive archive of High-Altitude Medicine and Physiology and it does indeed seem to be associated with John West’s Division of Physiology. Ah, another delve into Google Books suggests there is a link between Pugh and West. A book chapter by West mentions Pugh, and there is a photo of them together. Great story! How often do you find yourself called upon to play detective like this? Cath – Maybe two or three times a year. It could be more often, but our historical collection is not that well known and I don’t have the time to promote it. Sadly in three years time it will be got rid of. Got rid of? To another repository I hope. Hazel – Some things will probably be transferred elsewhere, but the reprints are unlikely to find a home. With luck, the catalogue to the reprints and pamphlets will be preserved somewhere.